Photos thanks to and courtesy of Nancy Young. Martini, made by La Rochère, Passavant-la-Rochère, Haut-Sâone, France. This delightfully unusual and deliciously stylish piece is shown here courtesy of Nancy Young, who found the first reported example and named it “Martini”. In marigold, this intriguing item stands on a stem and is around 4 inches high. Its distinctive slanting form has an Art Deco feel. The maker had been a mystery until recently when we observed a virtually identical item that had the maker’s name moulded on the base: LA ROCHERE FRANCE. ​What exactly is this piece intended for? ​It is a “coupe” - a shallow, broad-bowled, saucer shaped stemmed glass originally intended for champagne or cocktails, but also used for ice cream and sorbet. 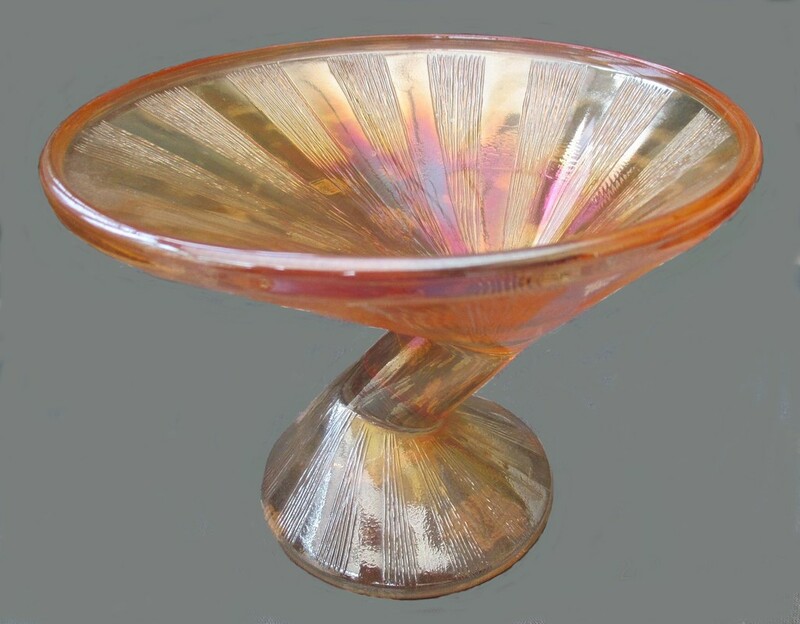 The deco-look asymmetry of this piece is typical of La Rochère - they have produced a number of similarly styled, tilted drinking glasses and ice cream “coupes” over many decades of production. We would guess that the marigold Martini “coupe” most probably dates back to c. 1930s. Besides the wonderful marigold item shown here, we believe that La Rochère also made some iridescent tumblers. Add another name to the list of Carnival Glass producers – La Rochère, France! Right: the La Rochère 2016 catalogue features a continuation of this style in several delightful versions and forms. ​The glassworks at La Rochère in the Lorraine region of north eastern France, is believed to be the oldest working glassworks in the country – remarkably, it is still fully operational. Established in 1475 by Simon de Thysac, initially producing window glass, and located on the edge of the forest (supplying wood for the ovens), the glassworks was beset by two centuries of unsettled conditions. However, in 1666 the glass furnaces were lit again and have not stopped burning! In 1858 Francois-Xavier Fouillot took over and his descendants still run the glassworks today. Tableware (ice cream dishes have become a speciality), drinking vessels of all kinds, lamps, vases, tiles and other decorative items have been produced by La Rochère. Traditional expertise and high quality has always been a key for the factory, while modernisation (including automated production) has been constantly developed. ​Today La Rochère produces both mouth blown and press moulded glass. The illustrations on the right are two public domain postcards showing the La Rochère glassworks (verrerie) in around 1904. Note the piles of wood in the foreground, used for fuel, and the water source, an adjacent lake.